This picture comes from Jackie, a 2005 member of Pioneer. This is one of my favorite shots of 2005! My name is Jackie, and I marched my first season of drum corps with Pioneer last summer. 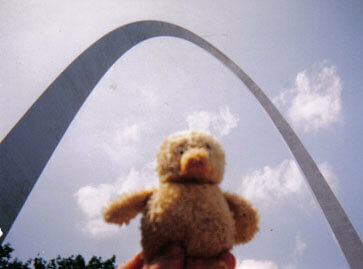 This picture was taken at the St. Louis Arch on a free day. The featured bird, dubbed "Lil' Momo," was given to me by my friends back home before I left on tour. They wanted me to take pictures of him wherever the corps traveled. Lil' Momo loved being on the road with Pioneer and even made it onto the field at the DCI World Championship Quarterfinals in the stick bag of one of the pit members. This chick was flyin' high.